Eglise Ste-Anne Church is the oldest Acadian parish on mainland Nova Scotia. Acadians returning from exile had settled the area in 1767 and built a small chapel for worship. In 1799, Father Jean Mandé Sigogne arrived and officially founded the parish of Ste-Anne. In 1808 a new church was constructed to serve the growing Acadian population in the area. However, the structure caught fire in 1900 and burned to the ground. Not to be defeated, the parish built a new church over a six month period, and opened to the public for Christmas mass in 1900. The parish is still active to this day. A municipality registered heritage property, the Romanesque style church features two towers with original paintings on the ceiling and sanctuary walls. The architecture and decor of Eglise Ste-Anne Church speaks eloquently of local faith and artisanship. In 1999, a painting of the annunciation was found in the church barn's attic, and is believed to have entered the collection of the church through its founder Father Sigogne. There are daily guided tours from mid-May to mid-August. 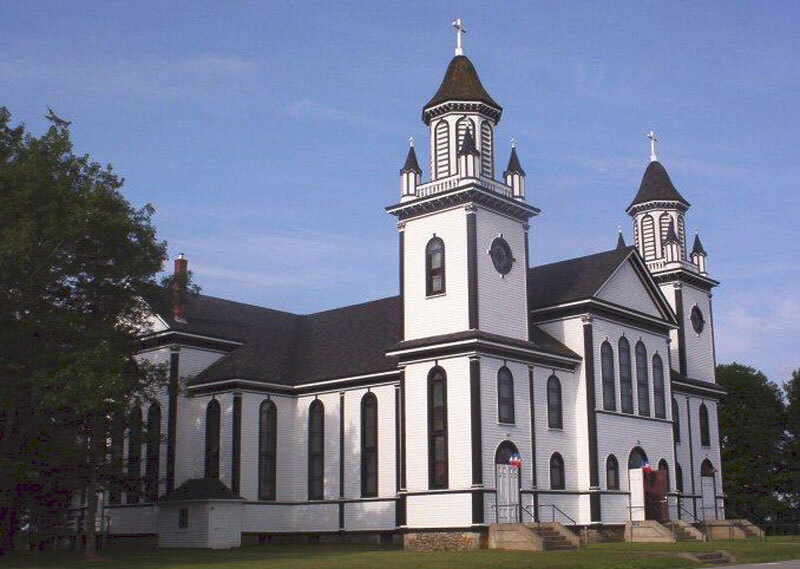 Paroisse Satine-Anne - St. Anne Parish is the oldest Acadian Parish on land in Nova Scotia.